The Sunken Temple of Chloren-Var from Wolfhill Entertainment first caught my eye because of the odd phrase in the description, "area variations based on light sources". I can't honestly think of another module that mentioned light sources. I kept my eye on it because it seems to be a product from a new company/person, and after seeing his promotional posts over on ENWorld, I pulled the trigger. At $5.99 it's right on the cusp of my price range for maybe products, but it is quite lengthy at 100 pages (100 real pages, not the padded sort that some people use that only have a few lines of text per page). It's something of a weird beast in that it's supposedly system neutral, but that system neutral is obviously an older school D&D. There are levels (this is for levels 1st to 4th), but instead of hit points, there are life points. 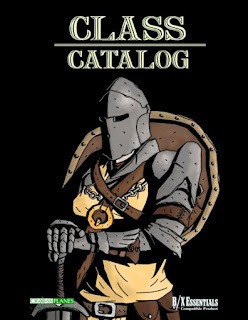 Armor class is given as an equivalent to armor, ranging from leather to field plate, but with some oddities, like bronze platemail (which is just the same as banded or splint, which it uses elsewhere). With that said, there's very, very, very little treasure, and for that matter, not much motivation for the adventure in the first place. When you start your day off by chasing off someone who is trying to steal your car, you think "Hey, at least nothing else today will be worse than that." No review this week. Was working on one, but then I got robbed on Wednesday. Nothing major, really, 2 guys in a white truck comes in. I thought they were someone else, a guy who cuts my hay (he's got a white truck and I live on an old 100 acre farm) so I ignore it as he goes and goes at least once a week. Then about 15 minutes later, it comes flying out and I notice it's full of my furniture that I kept in an old shed (no room inside). I yell at them, get out of the way of the truck, then chase them futilely. As they were mostly family old heirlooms (most notably being an old 5' globe from the 1800s and an old sea chest of my grandfather's), I wasn't ever going to sell them and so I have nothing to replace. But it's left me shaken up. The whole brazenness of it, driving up and taking stuff while the owner is at home. And then I wonder if I should have been more suspicious. And then I get angry because they had a newer truck than I do. And the local police didn't even call back, who knows if I will ever hear or get a visit from them. Polyhedron 40, 41, 42, and 43 - These are from when the Living City dominated the magazine. 99 cents each. Wilderlands of the Magic Relams, Revised Guidebook - Doesn't this come out (again) every 6 months? 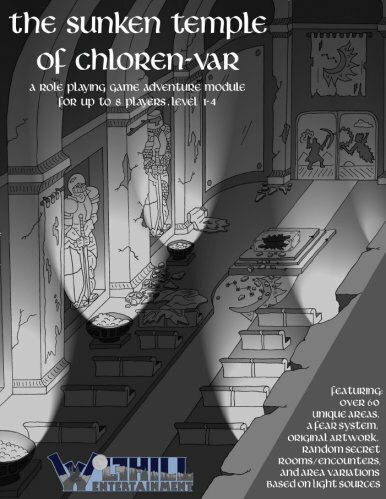 Update of the old Judges Guild setting $4.99, 38 pages, also available in print. The best time of year, baseball season is once again upon us. Also, a lot of adventures this week. Polyhderon 36, 37, 38, and 39 - These seem to be from the late 80s. 99 cents each. House of Illthrix - Apparently the first of three for the Avremier setting for OD&D. $2.99 and 29 pages. Men & Magic Compilation - Basically a reorganized OD&D, including the ranger, illusionist, and bard. Free! Back to BasiX Issue 8 - B/X fanzine. $2, 29 pages. Highlights seem to be two comics and a Jaquays interview. Friday Enhanced Map 3-29-19 - The latest in what I think is a multi-part dungeon. Mazith Random Cave Maker 2.5 - Program to generate maps of caves. PWYW. Perhaps the most notable thing about Basic/Expert D&D (and its later Companion, Master, Immortal successor) is race as class. In some ways it's both a strength and weakness, as it provides all sorts of different game play experiences by allowing monster characters, but it can also be restrictive when playing more human like creatures. What if you want to play an elf that isn't basically a fighter/magic-user? Class Catalog from Crossplanes Game Studio brings a variety of racial classes to B/X Essentials, a grab bag of AD&D 2e races (aasimar and tiefling), 5e races (dragonborn and pixie), as well as variants of existing ones (dwarven thief, dwarven priest, elven rogue, halfling burglar), plus the gnome and half-orc. On that Tuesday the store had quite a few new books from different series I liked to read. There was an L. Sprague DeCamp Conan novel; a Michael Moorcock Elric book; I think there was a Robert Heinlein in the batch. Anyway, as I picked up the seventh novel, a rough looking dude was grabbing books as well. As I selected the last book of the seven he took a copy of the same book. We looked at each other and smiled. He had sort of a biker air about him. He was wearing an old pair of jeans and a ratty blue-jean jacket. As we looked at each other's stack of books we realized we had picked the exact same novels. We got quite a laugh out of that. Then we got into a discussion on the merits of Robert E. Howard or L. Sprague DeCamp's version of Conan. During that discussion he hit me with the fact that he had a game where I could play Conan fighting against the priests of Set. Gary had set the hook and I was being pulled in like a ten pound trout. He gave me his phone number and told me the game was every Saturday.